The original Woodstock poster is undeniably one of the most famous pieces of music art. The legendary image of the dove perched on the neck of a guitar has become one of the works of art that defined the entire Woodstock Nation. A recent article in the Woodstock Times raised some interesting points and a question involving the work of art. Woodstock Story got the privilege to speak with creator Arnold Skolnick and get some insight on the artist and the legendary work. 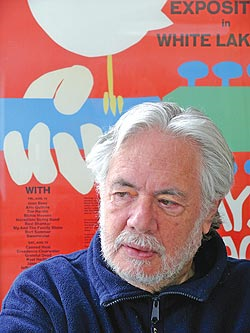 He was contracted to create the visual representation of Woodstock 1969. Woodstock Ventures asked Skolnick for a poster for a music and art fair lasting 3 days that was to be peaceful. His approach and inspiration comes from the philosophy that “the solution is the problem”. Many accounts of the piece site his two sons (or daughter that is nonexistent) as the inspiration for his work, which he states is not the case. The Woodstock Times article states that in Michael Lang’s book The Road to Woodstock, Lang claims the idea for the poster design as his own. “They asked for a poster for a music and art fair which would last for 3 days and wanted it to be peaceful. I was given the problem on a Thursday and I delivered it on Monday at about 11am. Mr. Lang never gave me any idea for the poster; he never saw it until it was finished. I don’t believe he and I have ever talked,” said Skolnick. After the Woodstock poster deal, Skolnick started a print company that produced, and published art books and limited editions after in the late 1970s. Many of the publications won awards for design and typography. Skolnick doesn’t define his career as being the guy who designed the Woodstock 1969 poster. Skolnick, now a resident of Chesterfield, MA is thankful that he was able to set the right tone for the festival with his work of art, but saw very little in return. Despite the rampant replication of his original catbird/dove design perched on the guitar, he has received only one check for royalties amounting to about $15. He continues to run Chameleon Books and works on his paintings, photography, and drawings holding various exhibitions in New York and Massachusetts. “The Woodstock poster has not changed my life or had any real effect on my career. It was just another design solution that became famous,” he said. Mr. Skolnick has recently released his design for the Woodstock 40th anniversary poster.